Behind the Scenes of Phantom: When Katrina Kaif wanted to fire guns! In Phantom, Katrina Kaif is getting ready to show the audience another side of her by playing an ex-RAW agent on a mission along with Saif Ali Khan’s character Daniyal. The story of Phantom, which will hit theaters on August 28th, is a political thriller set in the volatile climate that exists in South Asia. Constant terror attacks against India have left the Indian people feeling vulnerable and angry. The Indian government and security agencies are helpless as the masterminds of the attacks are out of reach. When an infiltrator with plans to attack India is caught, the Head of India’s security agency and his team take matters into their own hands. The film follows the protagonist Daniyal, whose journey to seek justice takes him to India, Europe, America and the volatile Middle East. Local assets in various countries help Daniyal, including Nawaz Mistry who works for an American security agency. Daniyal and Nawaz are drawn into a battle of wits with a shrewd and ruthless enemy. With the enemy hot on their heels, Daniyal and Nawaz against all odds try and finish the job they had set out to do. Along the way they find out that in a mission like this there is always a price to pay, in this case a very personal price. Now this being a dramatic thriller the lovely actress dons her action avatar and had to do some breath-taking action stunts. Not only is there an underwater sequence where Katrina had to be about 40 feet below water but there is also a very dramatic chase scene that Katrina wanted to really be a part of. In this sequence of the film, shot in ‘Beirut’, the duo is shown being chased by a Syrian tank. 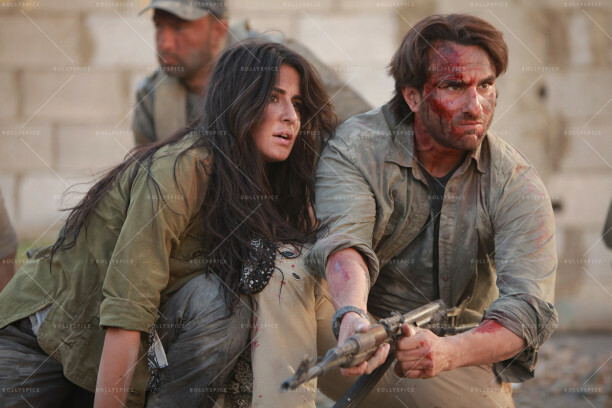 As per the script, Saif Ali Khan was supposed to fire a machine gun, while Katrina Kaif was supposed to take cover. But instead Katrina insisted she wanted to be the one with the gun. Talking to TOI, Katrina explained, “In that scene, Saif and I are in a jeep and a Syrian army tank approaches us. Saif had to leap towards the machine gun and open fire on them. When the shot was set up, our action director had conveniently thought that the jeep’s driver and Saif will be firing the guns and I will crouch and hide near the door. I explained to Sham Kaushal, the stunt director that I play an ex-RAW agent, trained adequately for combat. Then why do Saif and the army guys get a chance to shoot while I am expected to hide.” Apparently when director Kabir Khan came on set Katrina explained what she wanted to do. He agreed and changed it so her character was the one firing the guns in the scene. Check out these stills from the film! 16 queries in 0.716 seconds.